June Deveau will be giving a special presentation at the AGNS in Yarmouth this Sunday at 2 p.m. as part of the popular Creative Minds Series. 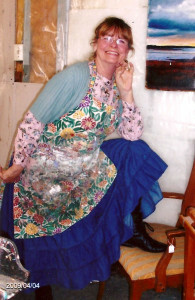 She’ll take us behind the scenes of her paintings as she discusses the inspiration that’s guided her for so many years. Namely, the rich cultural background that is rooted in the Acadian villages and landscapes along Baie Sainte-Marie, Nova Scotia, where she resides and works. Mostly self-taught, June has also over the years studied with several well-known artists and has participated in various solo and group shows in Nova Scotia, New Brunswick, Québec and Louisiana. While she primarily paints with acrylics, she enjoys watercolours, drawing, monotypes, and linocuts. Colour, texture and form have always fascinated her. 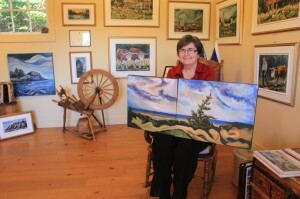 Her paintings reflect the beauty of her region, traditional arts, and values of the past. 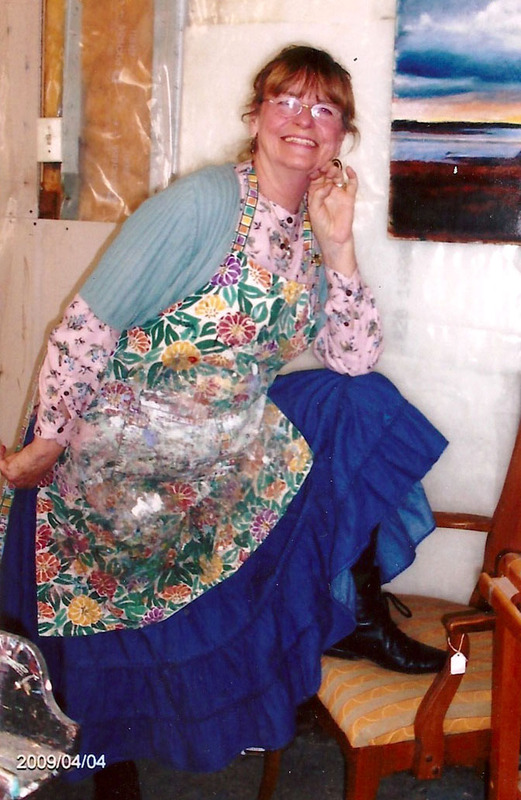 In 2003, June opened her gallery, June Deveau Galerie Studio, located in Saint-Alphonse, N.S., where she receives visitors from various parts of the world. 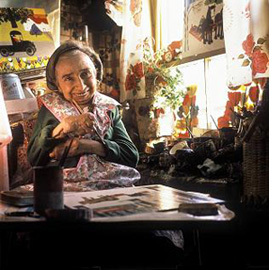 In addition to her personal artistry, and participation in various artistic projects within the schools, June teaches painting and sketching to residents of her community. She has also won numerous awards as a small-business owner. A selection of her artwork can be seen on her website, www.junedeveau.com. June has recently launched “Inspiration to Creation,” a tourism experience that allows visitors to participate in an exploration of various art forms, the Acadian culture and local scenery, then push their boundaries through creating works of their own. Please join June for her presentation this coming Sunday. There is no admission charge. Friends of the AGNS are pleased to open the 2014 Creative Minds series with The Plight of the Child Soldier—Innocence Lost, presented by Linda Marie Coakley, on Sunday January 26 at 2 p.m. This fall, Coakley worked with elementary students in grades 5 and 6 from Yarmouth Central School, and Barton Consolidated School in Digby County, under the auspices of ArtsSmarts. She helped them to respond dramatically to photographs from the Roméo Dallaire Child Soldiers Initiative at Dalhousie University. The students chose photographs that held particular interest for them, then discussed and created dialogues around these images. They also reviewed the UN Declaration of the Rights of the Child, and noted the abuses suffered by child soldiers worldwide. They observed on maps how widespread this unimaginable situation is around the world, and the changing face of war, with young boys and girls as unwilling soldiers. It was particularly meaningful for the students as many child soldiers are the same age as the Nova Scotia students. During her presentation, Coakley will give an overview of the project, and the profound effect it’s had for all involved. Bonus: the exhibit of selected photographs and the poetry that the children wrote are on display in the Community Room at the AGNS from Jan. 16-Feb. 23. No registration necessary. Admission by donation. For more information call 749.2248 or email agnsyarmouth@gov.ns.ca. Maggie Schmidt Mandell was born in New York City. From the age of nine, Maggie knew that she was meant to be a visual artist. Her parents made her a studio in a cabin on their property. She was later educated in Fine Art and Education at Pratt Institute of Brooklyn and also studied Behavioral Sciences, Sociology and Printmaking. In 1972, she arrived in Canada and then became a Canadian citizen. She has worked in the fields of education and art therapy in addition to her own artistic pursuits, with additional forays into dairy goat farming, the lobster fishery, communications, and advertising. Needless to say, such a varied background has served her well as an artist. Her work has been featured in numerous exhibitions, from Charleston, SC to Victoria, Montreal and Halifax. It may be found in the collections of many notable individuals and organizations, including Standard Life Insurance, Bank of Nova Scotia, Readers’ Digest and former Prime Minister and Mrs. Brian Mulroney. “In my talk, I will address being an artist all of one’s life … I am now 72, so it has been quite a trip to live the creative life.” In addition to the development of her own work, Maggie’s presentation will include a discussion of the role of women in the arts, the concept of painting as opposed to picture making, and the artist in old age. Maggie Schmidt Mandell now lives in Wedgeport with her husband, Roy Mandell, who is also a visual artist. Their website http://www.schmidtmandellstudio.com contains much more detailed information about both artists and their work. The presentation will take place on Sunday, December 1 at AGNS Yarmouth, starting at 2 PM. There is no admission charge. Sept 3 -29, 2013 Reproductions of Maud Lewis artworks on display in Th’YARC lobby in partnership with the Art Gallery of Nova Scotia, Western Branch. With Playwright Hal Theriault’s “Sharing Heritage through Theatre”. A creative mind is an asset in many occupations. Through our Creative Minds presentations, we will hear from people in our community who have interesting artistic passions. Hal started life as a teacher and after 18 years wanted to entertain through theatre, and while teaching he was involved in drama and writing plays. He studied drama and theatre at Acadia University, Queen Mary College, and University of London, England. Hal also did some acting in England. Hal also started his own company, Basin Productions, and worked in schools universities as well as prisons presenting plays dealing with racism, conflict resolution, etc. Hal has also written and performed full-length plays, dinner theatre, and spent five summers with his company performing on the M. V. Bluenose. Come and enjoy refreshments and good conversation. Maud Lewis Play at Th’YARC . Play writt en and directed by Hal Theriault. Film Screening of Maud at the Gallery 2pm. Maud-ify a “found piece”. 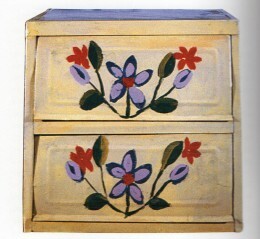 Decorate/paint found items in the style and spirit of Maud Lewis. 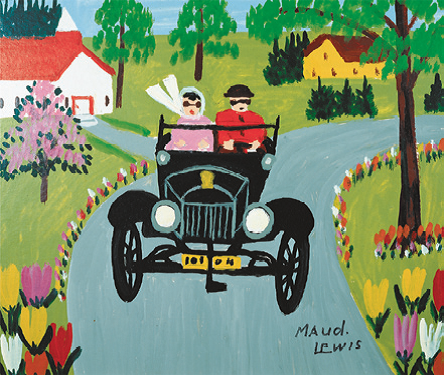 Have fun learning about Maud Lewis and how she transformed f ound items into pieces of art. Now it’s your chance to “Maud-ify” your own piece of artwork using bright beautiful colours. Limited space, call 902 749 2248 or email agnsyarmouth@gov.ns.ca register cost $5.00 per child – all materials supplied. You will be notified of all updates to this site.